Most of my blog entries have had to do with RVs, RVing, my See-the-USA-in-an-RV trip and people I’ve met along the way. I’m home at my apartment in Berkeley, CA for a couple weeks. Such being the case I have no RV specific travel news to report so I thought I’d write a little bit more about this blog’s head cook and bottle washer, about moi. You may recognize the title of this post as an excerpt from Shakespeare’s Romeo and Juliet. I chose that title because this post is about my flower photography. It’s about the road I traveled from my first flower photo which was done for fun, to making a business of selling cards with my flower photos, which, by the way, I’ve often been told are the best flower photos someone’s seen. In a later post I’ll write about the focus-stacking technique I use in order to render all parts of the flower in focus, something which until the advent of digital photography wasn’t possible. I began making my flower note cards at the request of a local florist to whom I’d been showing my photos. I’d taken to walking to a coffee shop about 1.5 miles from where live and I began photographing flowers growing in my neighbors’ gardens along the way. My neighborhood has a lot of nice gardens with beautiful flowers. The florist was next door to the coffee shop and I’d stop in to look at their flowers and chat with the owner, sometimes asking her to identify a flower I’d photographed in the neighborhood. This same florist asked me to make her some cards. A request which I resisted for some number of months because I didn’t expect there would be a way to do so profitably. After numerous requests I agreed to look into the feasibility of making some. 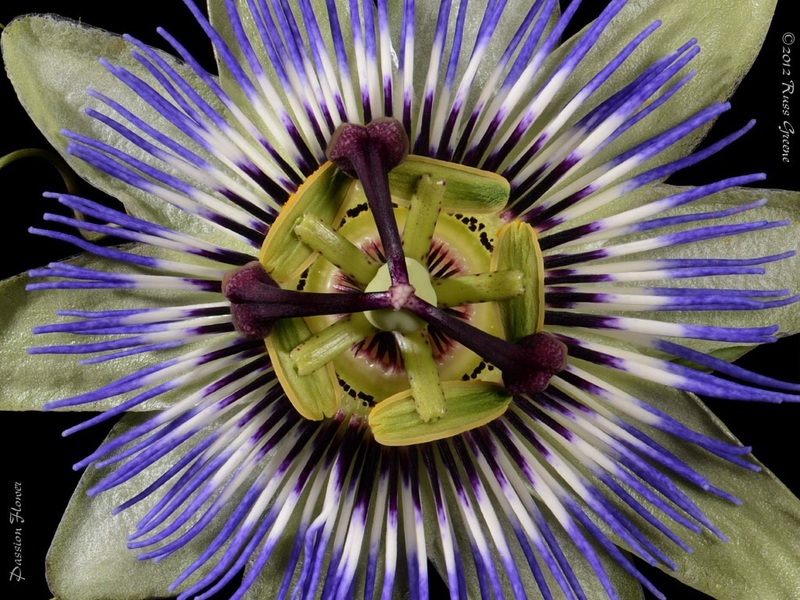 Passion flowers like this one grow on vines, and there are about 10 varieties growing within walking distance of my apartment in Berkeley, CA. One right next door produces an edible fruit, a yellow banana passion fruit which reminds me in taste of a grapefruit. They are just amazing flowers. I mean, look at it. Wow! My first attempts involved having cheap prints made at a local photo lab and double-stick taping them to blank card stock which I purchased already cut to size. This was a very tedious, labor intensive way to make cards, and the prints from the labs were of second rate quality. I wasn’t happy with this process or results and it seemed I was right about there not being a good way to make cards. I persisted, however, and in order to get better quality prints I began searching for card stock upon which I could print with my own inkjet printers. My printers are capable of making beautiful prints, but in order to get really good prints from Epson inkjet printers you’ve got to use Epson paper. This I learned a long time ago. Papers from independent manufacturers just don’t work as well. Either the inks don’t dry well, or you cannot get consistently good colors, or there was some other problem. I wouldn’t be surprised if this is true for other printer brands as well. After trying a number of card stocks from a number of suppliers I settled on one which took most of the Epson inks pretty well. It did struggle with certain shades of green however, rendering them somewhat grayish. There was an even bigger problem with this paper in that about 18% of it had defects such as small pits or pieces of debris embedded in the surface which made them unusable. It was worse than that, however. Once you made a print, inspected it and realized it was unusable, you had then paid for all the ink in addition to the paper, all of which became waste thereby raising the cost to produce the usable cards. As you may already know, inkjet ink is expensive! The problem of the surface defects with this one paper led me to inspect each and every sheet, one by one, before I printed on them. That was an arduous task requiring about 15-20 seconds per sheet, carefully looking at it under a bright light. This was a big commitment in time and not a particularly pleasant task, but for a while it remained the best option available to me. Now you might be asking why I didn’t just use Epson paper to begin with? That’s a good question, and the answer is that Epson does not make card stock, not one that’s viable for use in a commercial application. I only know of one card stock from Epson and it’s too thin, it’s much too expensive, and you have to print on a letter size piece of paper then tear out the card along perforations in the sheet. This may be fine for somebody that wants to print a small number of cards to send to friends or family, but not for somebody that wants to make a commercial grade product in larger quantities and to do so at a wholesale price where a reasonable profit can be realized. The next step in the evolution of my note card business was to start using an Epson paper which I purchase in large sheets and in large quantities. I then have the paper cut to size and scored (for easy folding) by a local print shop. In other words, I’m making card stock from paper designed for another purpose. This gives me cards that print well and that will also have a long life. The ink-paper combination I use has been tested by an independent lab in accelerated aging tests and should not yellow, fade or color shift over a lifetime. I’m producing giclée note cards, giclée being synonymous with highest quality. 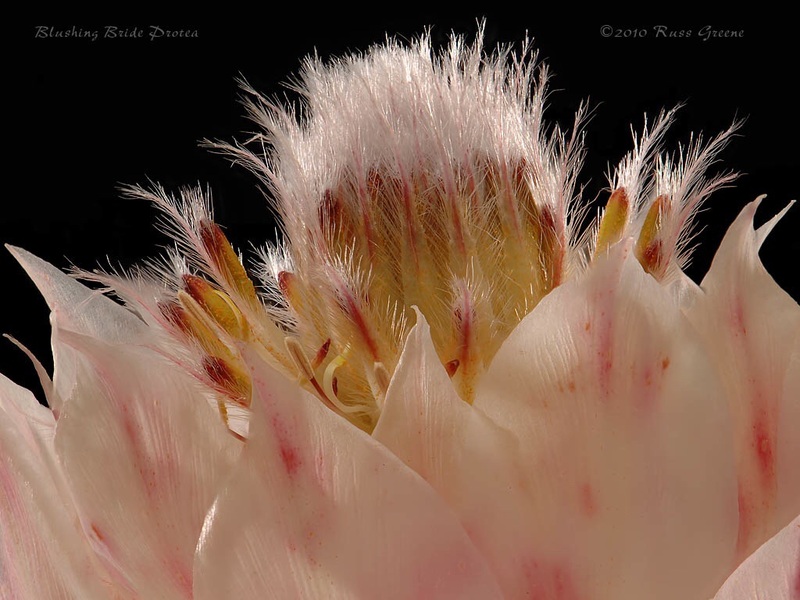 Shooting this delicate blushing bride protea took but a fraction of the time it took to retouch out the artifacts created by the focus stacking process. The paper I’m using now has a matte finish. I prefer glossy. It’s also a little bit thinner than I would like. Nevertheless, it provides me with the most workable solution I’ve found to date and allows me to make a very high quality product at a competitive price. Using a thicker paper with a glossy finish would result in cards too expensive to sell competitively at the wholesale level. Over the years of shooting flowers I developed what I call my flowers list. 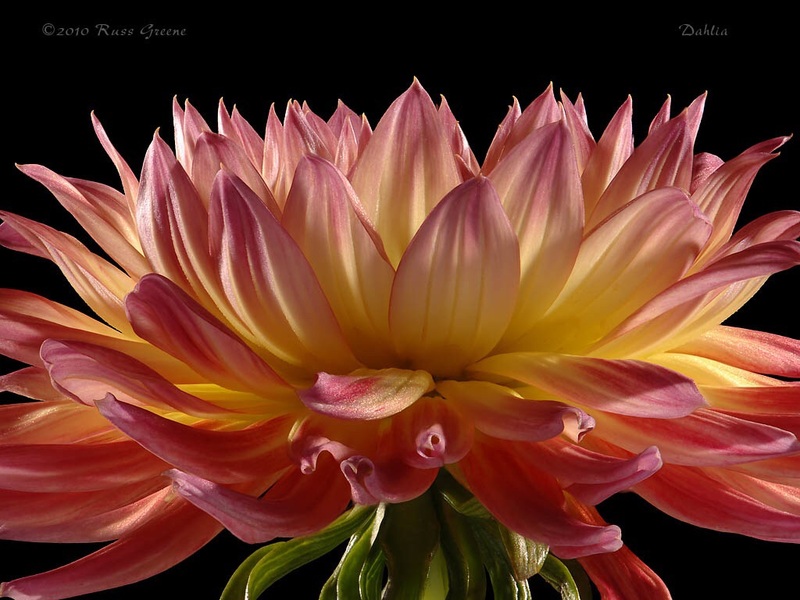 It’s an email list of people to whom I send digital versions of new flower photos as I create them, sometimes with information about the flower, the back story of how I came to find or photograph the flower, or the techniques used or special challenges faced when making the photo. Since I began my RV travels the flowers list has gone dormant because I haven’t been shooting flowers as I travel. I really can’t use the equipment I use at home in the RV. I mention the flowers list to you here on my blog because I created special, discounted pricing for my flowers list readers which I’ve decided to extend to my blog readers as well. While not discounted quite as much as wholesale the flowers list price is 33% below the suggested retail price of my cards. 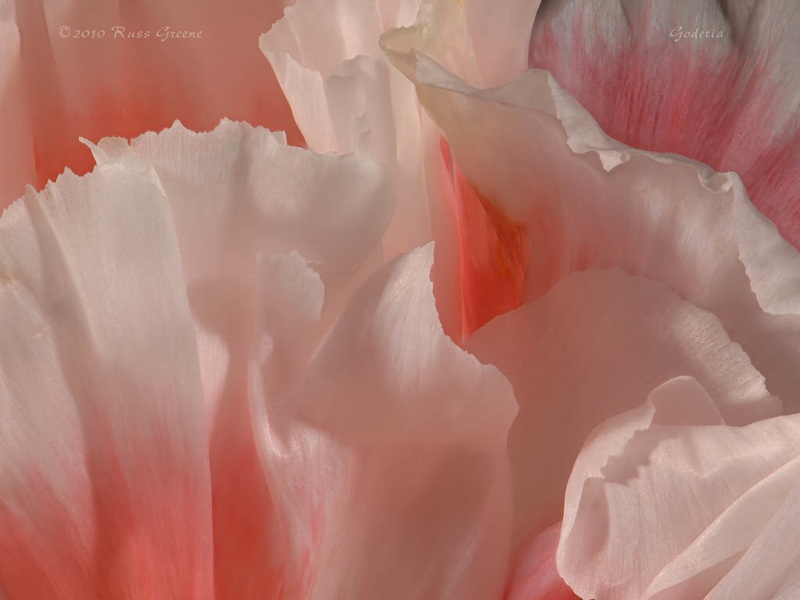 If you like flowers or fine-art artisan crafted note cards and are interested to learn more about my cards, the focus-stacking photographic process, to see the images I’ve created or perhaps even purchase some cards you can download my flowers list PDF catalog here. The catalog contains a cover sheet with a little info about me and the cards. It also has over 100 thumbnail images which are available as note cards. Please note that I am not making the Premium cards while traveling. 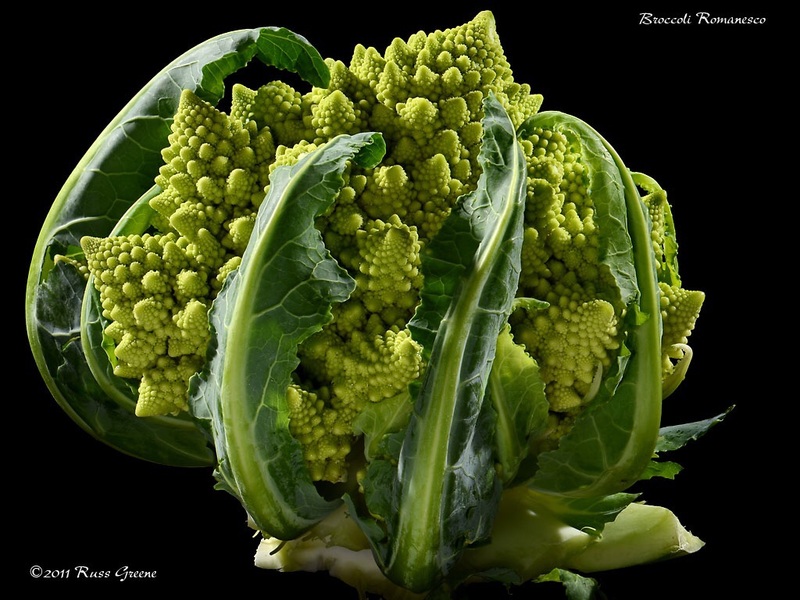 Broccoli Romanesco. Yep, this is an edible kind of broccoli and I found it at the supermarket! Fractals anyone? The cones are arranged in spirals, each one is made of smaller cones arranged in spirals which is made of even smaller cones arranged in spirals. Cool, huh? Later, I’ll write more about the tools and techniques I use to create my flower photos. For now I’ll just include a few on this page and wish you and yours the happiest of holidays and a safe and prosperous new year. I just came across your blog and am going to add it to my reading list. I also do photography, rv (not full time) and much more. 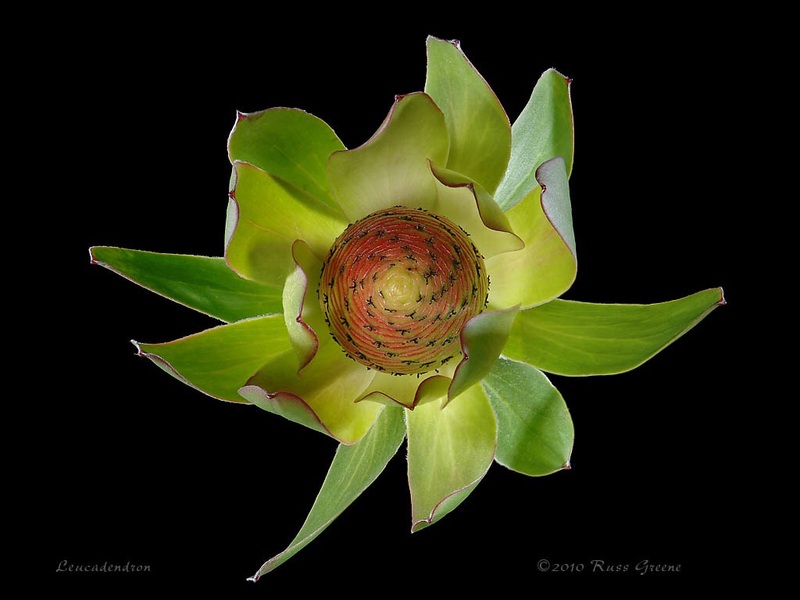 Look forward to more on your flower photography and am going to go read back on some of your older posts! You’re definitely a woman of discerning taste! Hahah. Thanks for your kind words, Ingrid. I’m so glad you’ve found something of value on my blog and I appreciate you taking the time to let me know. Wow!, that’s a lot of preparation to get a high quality product. You have been very persistent in your quest. My wife appreciates the time invested and really enjoys your flower pictures more than any other she has seen to date. Keep up the great work.